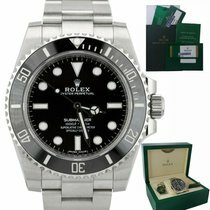 The Rolex Submariner No Date is the original version of the famous diving watch. For the first ten years of its existence, Rolex offered it exclusively without a date. This watch has changed very little over time and remains part of the Swiss luxury watch manufacturer's catalog to this day. Unlike its sister model with a date display, the Submariner Date, the Submariner No Date is only available with a stainless steel case. In addition, its dial and bezel are always black in color. 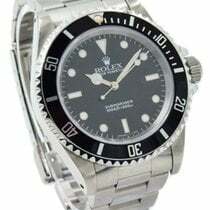 Advertised as the "diver's friend" when release in 1954, the Rolex Submariner No Date is, of course, water resistant. The earliest models were water resistant to 100 m (10 bar, 328 ft), though Rolex quickly increased this to 200 m (20 bar, 656 ft). The Submariner has been water resistant to 300 m (30 bar, 984 ft) since 1979. 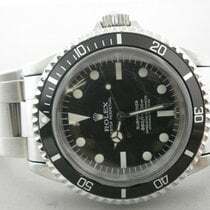 How much does a Submariner No Date cost? Thanks to its long history, there are many interesting vintage Submariner No Date models. Those known as James Bond watches are especially highly coveted by collectors. They were listed under reference numbers 6204, 6538, and 5510 and were worn by Sean Connery in his breakout role as Agent 007. All three lack a crown protector. The 6204 and 6538 were both powered by the caliber 1050, while the 5510 was equipped with the caliber 1530. Pieces with the reference number 6538 demand the highest prices, coming in at around 147,300 USD in good condition. A 6204 in good condition goes for about 97,000 USD. The least expensive of the bunch is the Submariner No Date ref. 5510. Prices for a never-worn model sit around 45,400 USD, while a pre-owned piece costs about 23,300 USD. 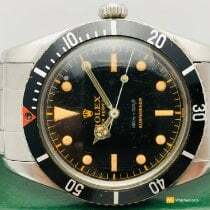 Collectors and fans also go crazy for the so-called "COMEX" models, which Rolex developed in cooperation with French underwater experts Compagnie maritime d'expertises (COMEX). These models were based on the 40-mm ref. 5513 and later received their own reference number: 5514. They are easy to recognize due to the white "COMEX" inscription on the dial and the sunken helium escape valve on the case at 9 o'clock. These pieces were created exclusively for COMEX, meaning their numbers are extremely limited. Accordingly, their prices are also high. Depending on its condition, plan to spend between 44,200 and 67,500 USD for one of these timepieces. This makes the 11,700 USD price tag on a standard ref. 5513 model in good condition look like quite the bargain. The model with ref. 14060 followed the ref. 5513 in 1988. Rolex equipped this edition with the caliber 3000. It was then replaced over a decade later by ref. 14060M, which was powered by the caliber 3130. You can purchase a 14060 for about 6,800 USD. Never-worn M-models go for around 9,500 USD, while pre-owned models come in at around 7,100 USD. The ref. 114060 replaced its predecessors in 2012. Its case and crown protector now feel somewhat weightier, and it features a maxi dial with enlarged glow-in-the-dark indices. What's more, the bezel inlay is now made of scratch-resistant black Cerachrom ceramic. The caliber 3130 is still ticking way inside the case, though it now includes a blue Parachrom hairspring. These watches are worn with a stainless steel bracelet featuring an Oysterlock clasp and the practical Glidelock extension system . This system allows the wearer to easily extend the bracelet by five millimeters. 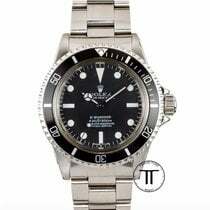 Plan to spend around 8,100 USD for a never-worn version of this Submariner No Date. Prices for pre-owned models in very good condition sit around 7,600 USD.